Everyone wants a happy heiny - it's just a good thing. With Happy Heiny's cloth diapers not only will your little one be happy there, but you'll bee happy too -easy to use, adjustable, great performance & lots of styles and cute designs to choose from. I have a Happy Heiny's One Size aplix & sherpa fitted Heiny Huggers and they are wonderful. Happy Heinys One Size diapers are designed with the same quality of the Happy Heinys Pocket Diapers only they are made to fit baby from birth to potty training. Happy Heinys uses their own custom milled fleece and high quality products made right here in the USA. You will find on your one size diaper a total of 4 snaps on the front. This will give you a total of 4 different sizes for your diaper. This will allow the diaper to fit most babies from about 8 lbs - 35 lbs. An investment that will save you money throughout your diapering time. Happy Heinys One Size diapers are available in many different colors and several adorable prints. The prints for the one size diapers are made out of the same high quality fabrics that the solids are made out of. These fabrics have been tested to last up to 12 hours at night for most babies. When you purchase a Happy Heinys One Size diaper you will receive 2 microfiber inserts (one small & one large). You may use 1 insert or both depending on how heavy your little one wets. 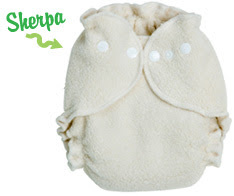 Their very popular sherpa fitted diapers, Heiny Huggers, are made of two layers of highly absorbent sherpa and three layers of terrycloth for maximum protection - without being too bulky. Our testers have reported nothing but positive results. Fitted diapers and do need to be used with a cover. For night time use, fleece and wool covers are wonderful, as they allow baby's skin to breathe all night. We recommend fleece or wool covers. The Happy Hempy without microfleece is an all natural diaper. Happy Heiney's won the iParenting Media Award! - We are very pleased to announce that our Happy Heinys One Size Pocket Diaper has won the iParenting Media Award! ~ iParenting Media Awards: Happy Heinys is pleased to present their New and Updated One Size Pocket Diaper. It fits most babies from birth to potty training. They are available in 22 unique colors and prints. We are proud to say they are made in the USA by moms for moms and have been featured on TLC and Time. *Follow me @jamaise at Twitter & Tweet this : RT @jamaise #GIVEAWAY #WIN - Happy Heiny's Cloth Diaper of your choice!! @ Wishing Penny #clothdiaper http://bit.ly/aIpDxa Ends 8/10 tweet each day for one entry each ! Disclaimer: Happy Heiny's provided me with a free sample of this product to review, and I was under no obligation to review it if I so chose. Nor was I under any obligation to write a positive review or sponsor a product giveaway in return for the free product. These views are my own. 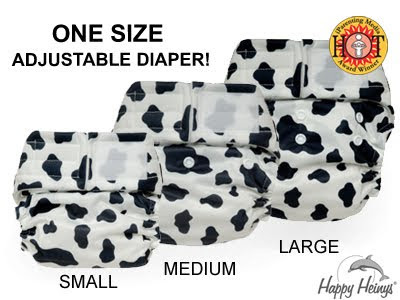 I'm following you with Google Friend Connect and I would choose the One-Size Pocket diaper in snaps in the Cow Hide print. I'm also interested in trying the Wool Cover! I would choose the Mini One Size in Red. I follow you on GFC. I left a comment with a description and link on HH's Facebook page! I like HH on FB. I follow HH on Twitter. I'm on the fence about the one size with snaps and the pockets. But the cheetah print is awesome! I would love to try the tie die one size snaps diaper!! Too cute!! I am a google friend connect follower!! I would choose the One size Happy Monkeys with snaps. I follow on google friend connect and I would choose the one-size Cow hide in velcro. Like Happy Heiny's on facebook #1. Like Happy Heiny's on facebook #2. I follow, and I would choose the snapping OS pocket in Violet! Left description and link on Happy Heiny facebook #1. Left description and link on Happy Heiny facebook #2. Left description and link on Happy Heiny facebook #3. Follow Happy Heiny on twitter #1. Follow Happy Heiny on twitter #2. I would choose Organic One Size Pocket Diaper in Red. I would choose the monkey print, very cute. I am a friend on gfc. I am a fan of Happy Heiny's on facebook. I entered your Wishing Elephant give away. following your blog through google friend connect and i would LOVE LOVE LOVE to have one of the classic organic one size diapers with the velcro closure. these are the ONLY diapers that work for us overnight! i already like happy heinys on FB... awesome diapers! left a giveaway post on HH FB page!!! Yay! i follow @happyheinys on twitter!